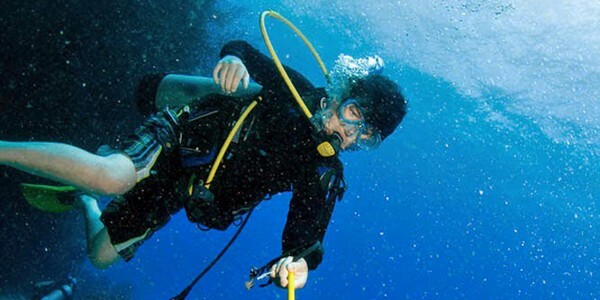 We spent three days exploring rich, varied undersea bottom topography with its mélange of deep canyons, steep cliffs, coral ledges and lofty pillars rising from sandy bottoms 60 feet deep. At each dive site the skiff would drop us at one point and we would swim to the bottom and travel about a quarter of a mile underwater to our take-out, moving with the current under spectacular overhanging ledges, through caves and catacombed buttresses, many of them housing cleaning stations where larger fish would stop to have their teeth brushed by tiny gobies. 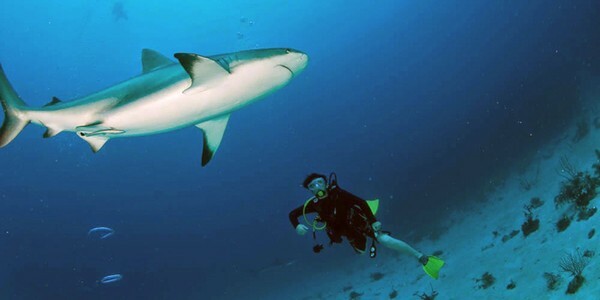 Since these waters had not been fished for nearly 20 years, thick schools of curious reef sharks, many of them more than 8 feet long, and 300 pound Goliath groupers—mostly extinct elsewhere in the Caribbean—followed and occasionally nuzzled us like friendly Saint Bernards. 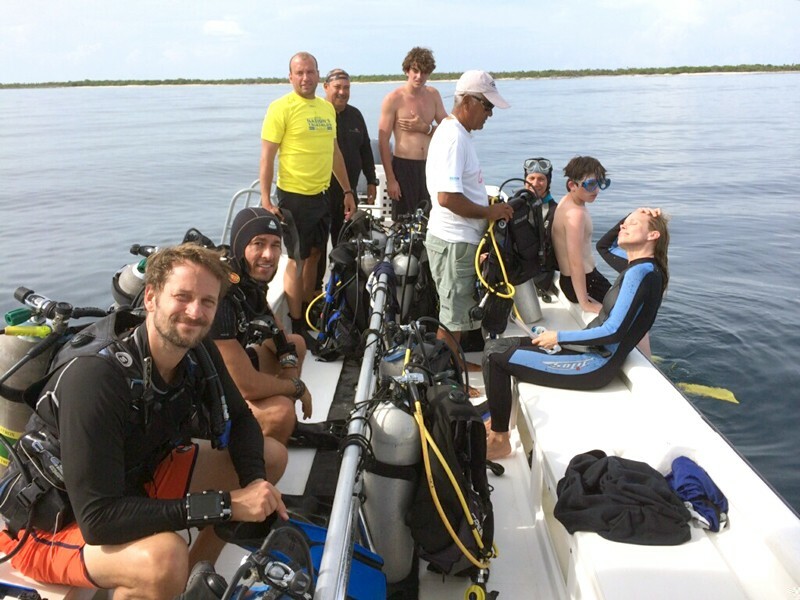 Near the end of our first dive at a site called El Quebrado, we moved back into shallow waters around 40 feet in depth, where we floated, captivated, above vast forests of vibrant, towering Elkhorn coral. Our dive master Noel Lopéz Rodriguez told us that we were seeing the best living example of this species remaining in the world. During later dives at Octopus Cave and Finca de Pepe, we saw Hawksbill and green turtles swimming over crowded groves of sponges and brain coral, sea cucumber and thick forests of hard and soft coral tubes. 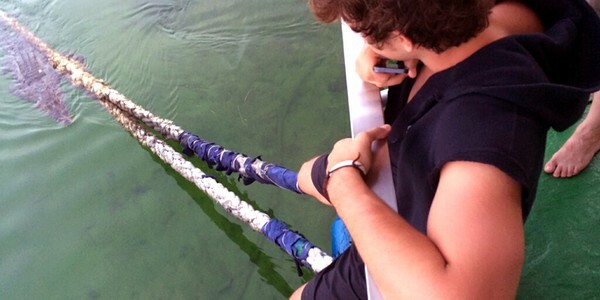 I was excited to see tangled webs of black coral in great abundance in just 20 feet of water. 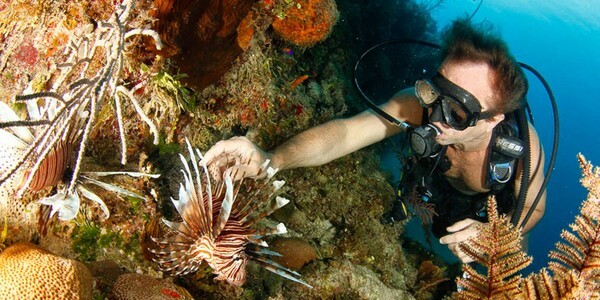 In the rest of the Caribbean that species is rare in waters shallower than 90 feet, having been plucked and cut by divers to feed the jewelry trade. 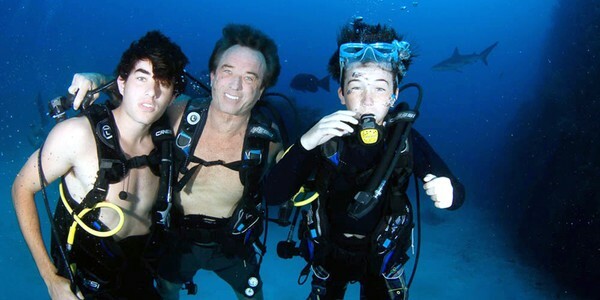 Over the next few days we made a dozen similarly spectacular dives. 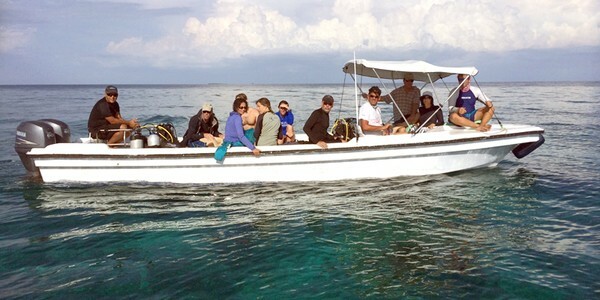 On the second morning we dove Cabezo de la Cubera, a site dropping from a bustling shallow reef down a 50-foot wall accompanied by our ubiquitous posse of sharks and Goliath groupers to find a shipwreck housing giant green and spotted moray eels. A glistening cloud of tarpon, shiny as mirrors, surrounded, and then enveloped us in their school. Living organisms occupied every inch of space on the busy reef. 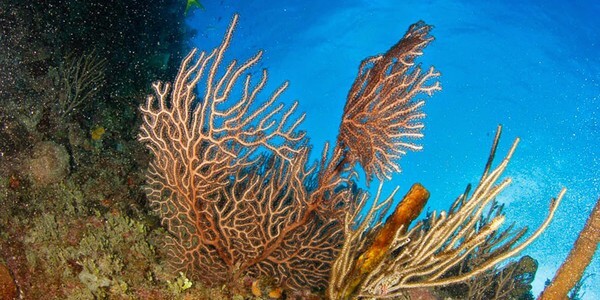 I recognized live brain, staghorn and sheet corals, and basket and vase sponges beneath the bushy expanses of waving sea fans. The reef was alive with colorful aquarium fishes like sergeant majors, purple and yellow fairy basslets and bluehead wrasse, along with multi-colored micro lichens, sea urchins, tiny iridescent shrimp and long legged arrow shrimp that looked like daddy long-leg spiders with blue bodies and shiny yellow claws. We watched blue and peacock colored parrot fish, brilliant red file fish, triggerfish and angel fish grazing on the coral while squirrel fish and spode fish hid on their sides in the crevices, holes and under ledges. During an early morning dive we followed schools of tarpon along the sandy bottom below the cliff base, past caves and over hanging rocks covering the sandy bottom below the towering bluff. As usual, there was too much to see and my brother Aidan and I ran short on air. 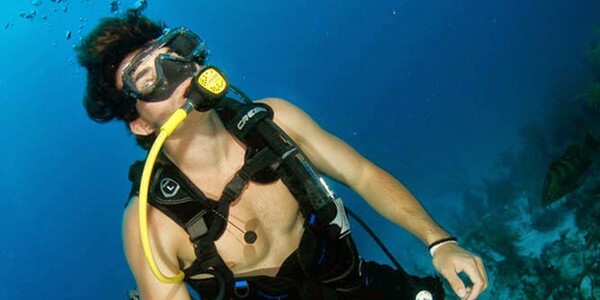 In a hurry to surface, we exited upward through a steep coral chimney, chasing a giant barracuda that loped warily above us while a large reef shark pursued us from behind, then suddenly rose up between us; close enough to brush us both with his sandpaper skin as he passed. Back at the Avalon II, to pick up fresh tanks, we found two uniformed officials from a Cuban government vessel who had arrived during our absence with a letter from Castro thanking us for visiting his beloved Gardens of the Queen and encouraging us to report back to him on the conditions of the reef ecosystem and how the reserve has responded to government protection. After our second dive at a site called Five Seas, we stopped for a picnic lunch at an island named Boca de Predra. The moment we beached our skiffs, we were mobbed by what seemed to be a pack of Cocker Spaniels in the shape of rats. 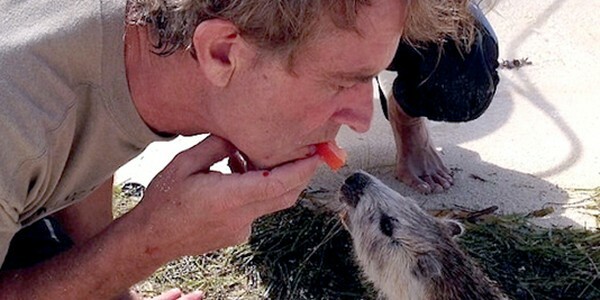 They turned out to be giant rodents known as “jutias" who rushed from the mangroves to greet us on the shore. As friendly as kittens, they stood on their hind feet begging for food. Aidan gave them pineapple from our lunch box. Dad fed them watermelon from his mouth until he got scratched on the face and bled. Encouraged by our generosity to the rats, waves of iguanas and hermit crabs followed the jutias out of the mangrove. 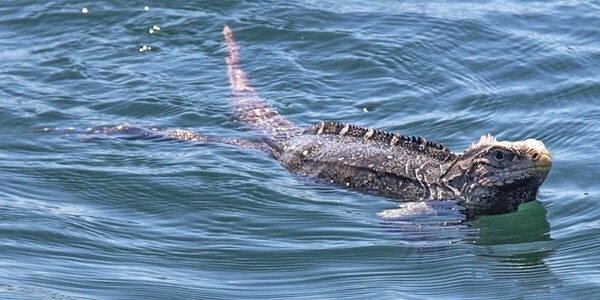 Soon the beach was crowded with rodents, reptiles, crustaceans and humans, all just searching for food and friendship. During early morning dives at Luisa's Reef and Los Mogotes we dropped over a 60 foot ledge carpeted by healthy coral and found an amphitheater encircling a shrine of standing coral pillars each laden with multiple cleaning stations. 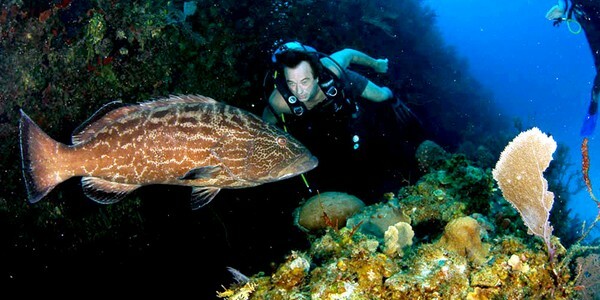 Among the living columns we found Nassau grouper, goliath, tiger and black grouper, tarpon, barracuda, jacks and sharks. Then, at Noon, we lit out for unexplored regions motoring west 27 miles to Cayo Alcatraz to explore new frontiers near the edge of the marine reserve. We moored next to a mangrove island adjacent to a frigate bird rookery called Cinco Ballas, where thousands of baby frigate birds and egrets begged for food from nests a few feet off the sand. 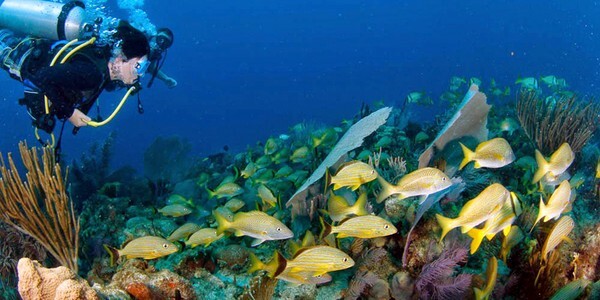 The Cuban government has done an excellent job preserving the Gardens of the Queen and we hope our survey of these remote reefs will help bolster Cuba's enthusiasm for marine protection and provide data to support an economic justification to enlarge the reserve. The government requires that any jobs lost by fishermen be replaced by jobs in tourism, fishing, diving or in outfitting expeditions. For example, many of Avalon's staff of safety divers and skiff pilots and chefs were former fishermen. 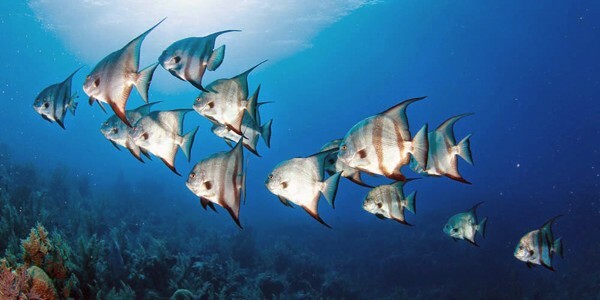 The Cuban government must make delicate calculations that preserve jobs, protect the reef and limit tourism to sustainable numbers. 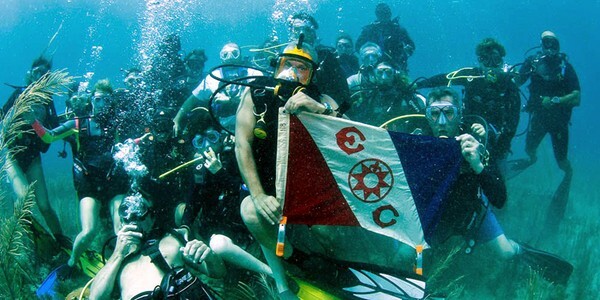 The Explorers Club scientists and conservation experts believe it's possible to extend marine protection to the new zones with sustainable eco-tourism as an economic driver to protect existing jobs and create new ones. During a shallow snorkel dive at Cayo Pedra de Pitoto Nino we found a massive heap of tightly meshed dead corals, possibly pulverized by tropical storms and hurricanes over time. Wave currents and tides had since pressed and woven the skeletal mound into a consolidated pile nearly an acre in size. The marine biologists and scientists in our group were ecstatic to find new, living brain, stag, elkhorn, fire coral and sea fans sprouting from the skeletal stack. The newly rejuvenated reef is a sign for hope elsewhere. 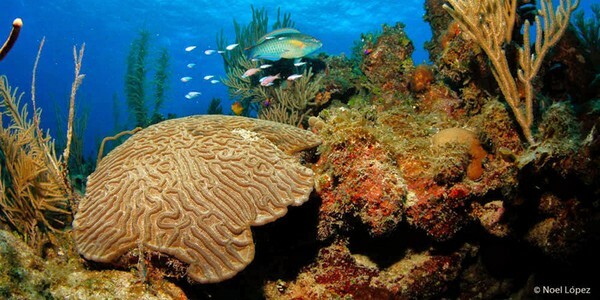 Duke University marine biologist and professor Rebecca Vidra told us that this was an exciting discovery for the world's marine biologists, many of whom are struggling with the problems of reef restoration around the globe. 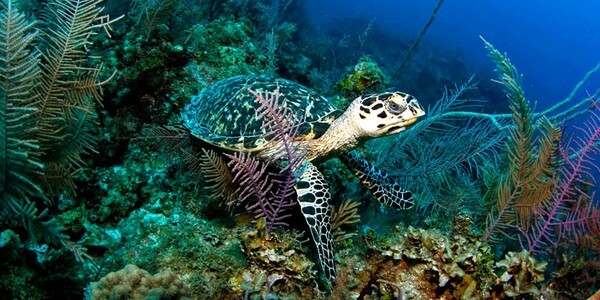 To her knowledge, it was the first example of obliterated reef rejuvenating itself in this way. 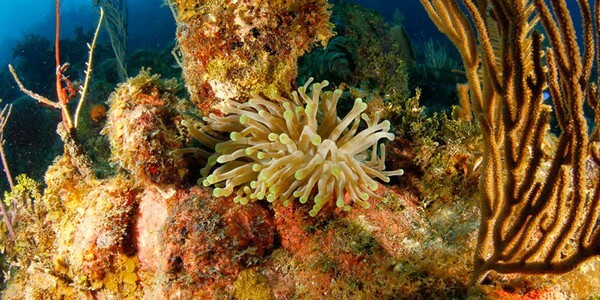 Man-made efforts to resurrect reefs damaged by ship strikes or pollution have, sadly, been largely unsuccessful. It is believed that local fishermen have named this submarine feature the “floating reef" because it appears to move unanchored about the sandy bottom posing a navigational hazard. That night, violent storms lit up the evening sky. 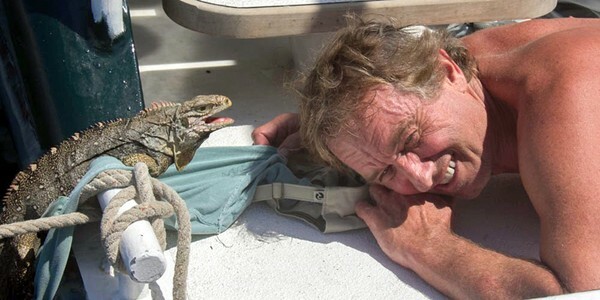 In the morning a three-foot iguana swam up to our boat and climbed aboard, with my dad's help. The lizard demonstrated its gratitude by trying to bite his nose. Luring a crocodile to the Avalon II. 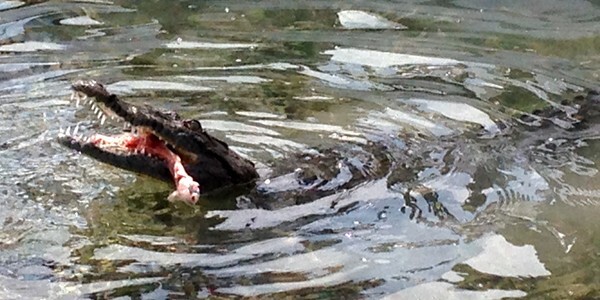 Feeding a crocodile from a skiff. 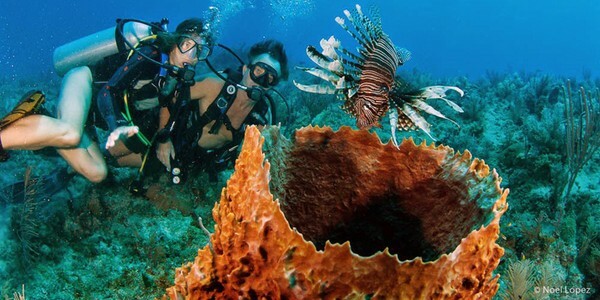 At Los Mogotes, we had the best dive of the trip—and of my life. At around 70 feet at the base of a steep escarpment we found a sandy bottom bristling with an exotic living geology of coral towers catacombed with caves, holes and chimneys. We explored vibrant coral cliffs cut with deep crevasses and steep buttes where every tiny crevice and cranny was occupied by giant coral crabs, squirrel fish, sergeant majors, porcupine fish, stone crabs and moray eel. 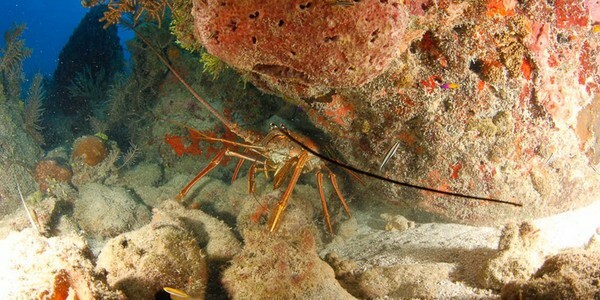 In the larger caverns, we found metropolis of spiny lobster, some of them quite massive. A giant porcupine fish hid in a thick grove of stag coral. Above wide coral prairies, a pair of reef sharks cut innocuously through a school of jack crevalle and then herded the jacks into a rolling fish ball and pushed it through the water column, keeping pace with us as we swam with the current. 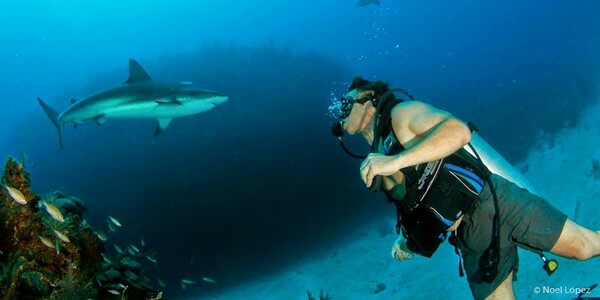 Individual jacks peeled away from the school to pursue the sharks and rub their skin against the sharks' sandpaper hides, a maneuver that clearly annoyed the giant predators. We watched rivers of yellow tailed snapper cascading over the palisades to school in the middle of the water column followed by gleaming strata of tarpon that pooled above them mingling there with Jack Crevalle, horse-eye jack, yellow jack, big cubera snappers and sleek cero. A few large barracuda and a half dozen species of grouper, hugged the bottom just above the reef. It felt like Grand Central Station at rush hour as thick aggregations of fish commuted to and from work with tarpon above, grouper below and the snapper schools in between. 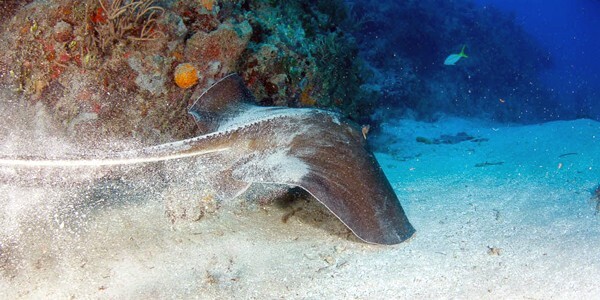 Only the giant southern sting rays seemed to have missed the wake-up call, snoozing on the sandy bottom between coral ledges surrounded by gargantuan conch moving glacially. 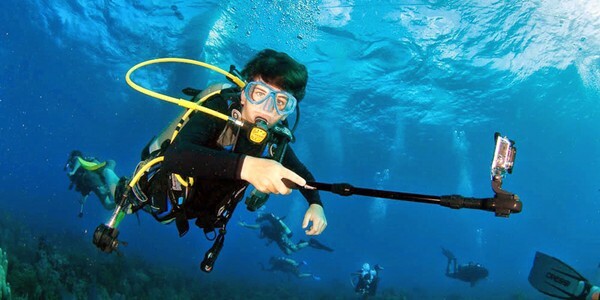 Aidan and I took time to stroke the long scythe-like tail of a nine foot nurse shark hiding in a shallow cave. He wagged his tail to scold us away. That night Ocean Doctor President Dr. David E. Guggenheim confided that those aggregations were the biggest fish highways he'd seen in 40 years of diving. 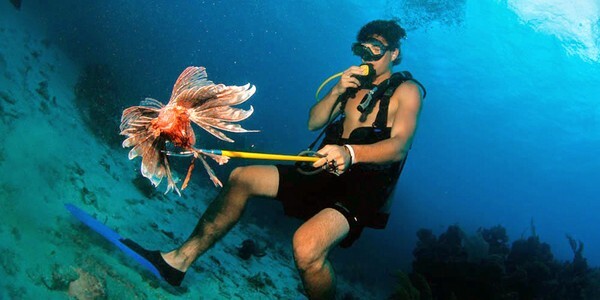 On the way to our take-out, we followed 120-pound snapper loping lazily through a canyon as Aidan shot voracious reef killing lion fish with a tiny Hawaiian sling as part of an experimental study program to try to teach local predators—groupers and shark—to eat this spiny exotic. Seeing this living reef with almost no visible bleaching—all teeming with robust reef fish and pelagic fish populations, made many of us feel like we had made a journey back in time. To me, the ocean looked the way it does in the old Jacques Cousteau films—with every part of the reef and surrounding sea crowded with bustling populations of living corals and fishes. We were especially excited to think that we might have been the first humans to see this particular underwater paradise.